This is the best time of year! I love the fall and from October through January my favorite holidays come one after another starting with Halloween. 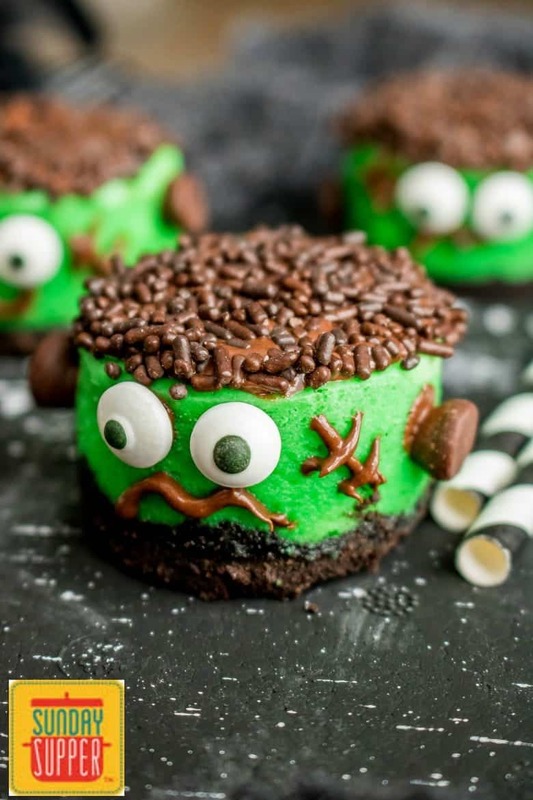 That means lots of parties and all sort of fun Halloween finger foods like these totally adorable Mini Frankenstein Cheesecakes! My kids are still young so we try to keep our Halloween festivities on the cute side rather then super scary. 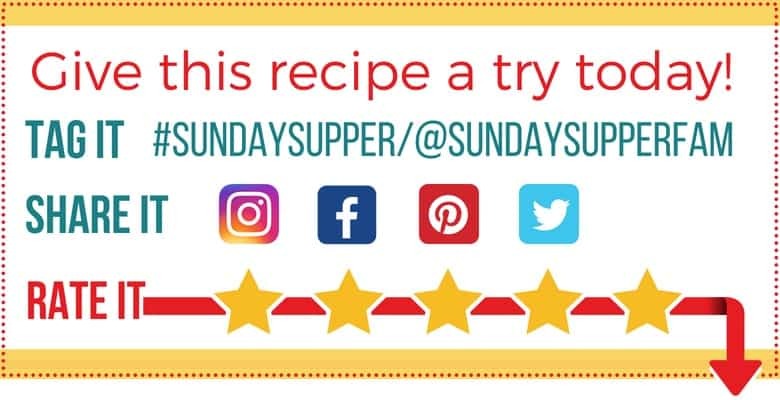 Every year as soon as we have that first cool day I start thinking of Creepy, Clever, and Fun Halloween Recipes for our annual Halloween party. 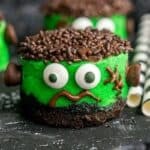 This year our Halloween party theme is “Craveyard” and there will be a table full of crave-worthy Halloween finger foods including Ghost Goo Cupcakes and these easy, but awesome Mini Frankenstein Cupcakes. These mini cheesecakes only take a few ingredients to make but they are absolutely delicious. Kids and adults are going to love them! The crust is made from crushed chocolate cookies and a little butter. I have a mini cheesecake pan that I use to make these. It is a lot like a muffin tin but the bottoms of each cup lift up and out which I love, but if you don’t have one you could use a muffin tin. Just make sure you grease the sides so the cheesecake will come out easily once it has cooled. I place the crust mixture in the bottom of each tin and press it down firmly so it is nice and solid. The batter is a simple cheesecake batter made with cream cheese, eggs, sugar, and just a little flour. To give them that deep green Frankenstein green color I added about 20 drops of green food coloring. The batter is poured into each cup filling it just below the top of each. Then the pan goes into the oven and you bake at 350 degrees F for about 15 minutes. Then remove the pan from the oven and let the cheesecakes cool completely. 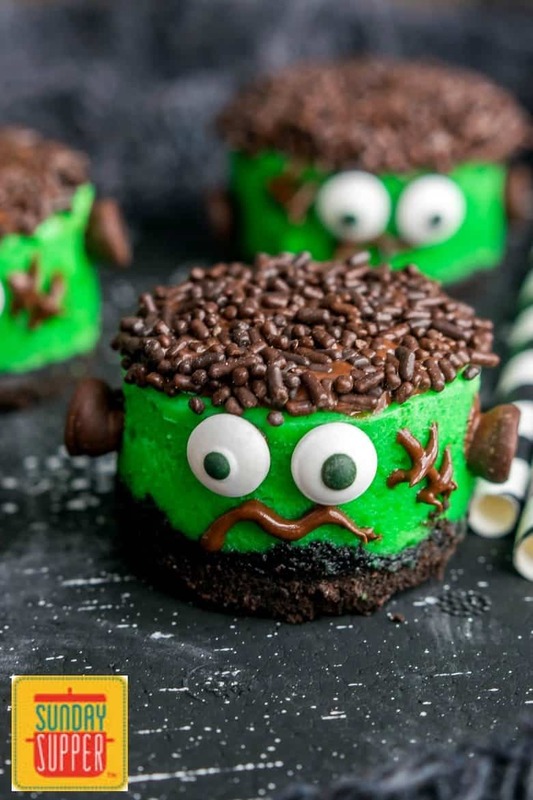 These easy Mini Frankenstein Cheesecakes are the perfect Halloween finger food! Your guests are going to love them and so will your kids. 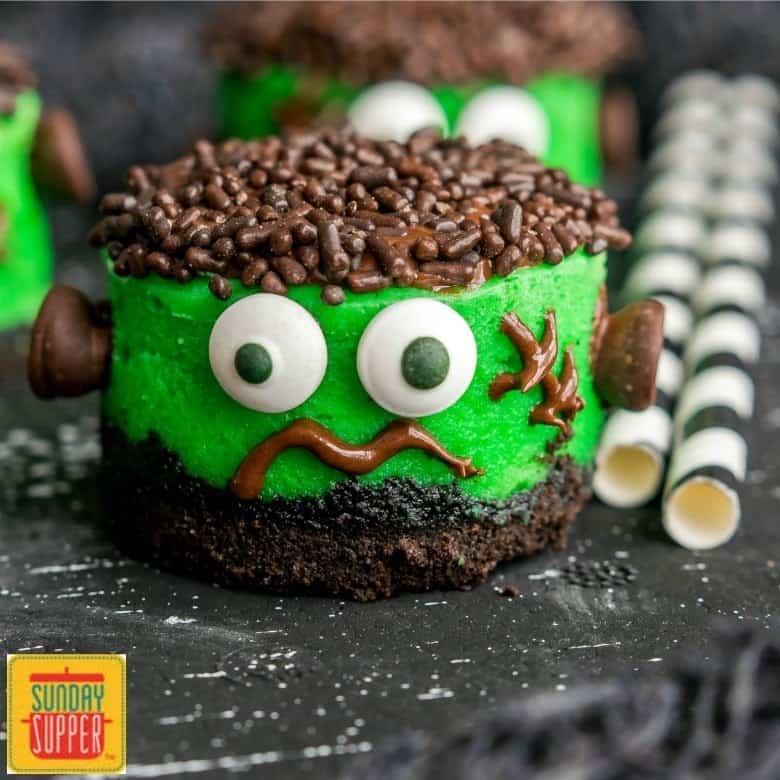 Make this awesome Halloween dessert for an upcoming Halloween party or just as a fun Halloween treat for your family. These are adorable! And even better, they’re mini cheesecakes!!! I seriously cannot get over how cute these are! I cannot wait to make these for my cheesecake loving family! They’re adorable!!! You look a bit confused, Mr Monster. Let me help you…into my belly! Sooooo cute! Pinning of course =) P.s. Thank you for all the optional hair-dos for Cheesecake Monster-san.